The northern regions of Galicia, Asturias, Cantabria and the Basque Country make up Green Spain. Very little of this part of Spain was conquered by the Moors. And don’t expect the searing sun or daily bullfights or flamenco here – this is the Atlantic coast. But just because it looks and feels different doesn’t make it any less Spanish! When we describe Galicia we speak of picturesque fishing villages where we order amazing seafood platters featuring octopus, mussels, clams, scallops and the smaller zamburina. We think if the wonderful crisp white Albariño wines – some of which are even made in palaces called pazos. We remember the small churches and monasteries along the Camino de Santiago and the majestic cathedral in Santiago de Compostela. We visualise the calm estuaries of the Rias Baixas and rough seas of the Costa da Morte including Finisterre. We hear the ‘gaita’ which is a local bagpipe playing in Combados beside the charming Parador. It all feels so Celtic. We remember the boat trip out to the Cies Islands and our hike to the top. And the hearty empanada pie we enjoyed when we got back down. The UNESCO walled city of Lugo. We even learned a few words in Gallego – which is the local language (although everybody speaks Spanish also)! Asturias for us is all about natural ciders and hearty mountain stews after walking the intrepid Cares Gorge Trail or visiting the sanctuary of Covadonga by the glacial lakes in Cangas de Onis. It’s a natural paradise, as they say themselves. We contrast that with the golden hues of elegant Oviedo’s atmospheric squares and parks and contrast it again with the blues and greens of the sea at maritime Cudillero and Llanes. We envision the traditional, colourful old farmhouses and splendid mansions built by successful emigrants returning from the New World. And the tangy blue cheese and comforting breadcrumbed fillet ‘cachopo’ – which easily feeds a family of four. Bagpipes again are very typical here. Tremendous pride in the flag and Patria Asturias. We move onto Cantabria and its unique UNESCO-listed cave paintings at Altamira. Medieval Santillana del Mar with its cobbled streets, proud cut stone palacios, carved stone crests and Paradores. Beautiful Lierganes with its Roman bridge, magnificent historic centre, delightful farmers market (for amazing cheeses) and the nearby craft beer brewery. In Santander, we climb the roof terrace of Renzo Piano’s art centre that compliments the beauty of the bay and Magdalena Palace. We order seafood again – calamari in batter and the most delicate of cured anchovies from Santoña and prized all over Spain. We drive inland to step back in time in Barcena Mayor and Cabuerniga and picture-perfect Potes (and its amazing micro-climate) for a rewarding hike in the Picos de Europa mountain range and the melt-in-the-mouth stews made from wild boar and pulses. 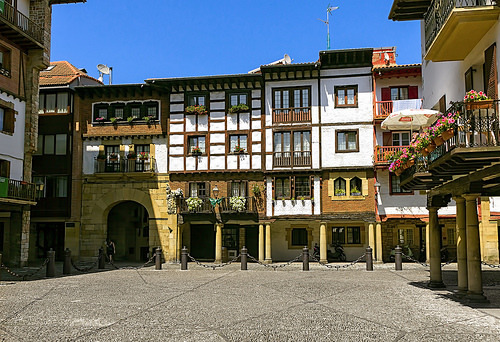 And let’s not forget Cantabria’s Michelin-star restaurants – unique experiences and fantastic value for money! Into the Basque Country and WOW! It’s Frank Gehry’s Guggenheim, the titanium wonder in Bilbao followed by the restored Ribera food market and then it’s time for a classic ‘bacalao al pil pil’ with a local txacoli white wine. A drive in the countryside taking in Bermeo and a few more coastal towns. A brisk climb up the steps of San Juan de Gastelugatxe of Game of Thrones fame. 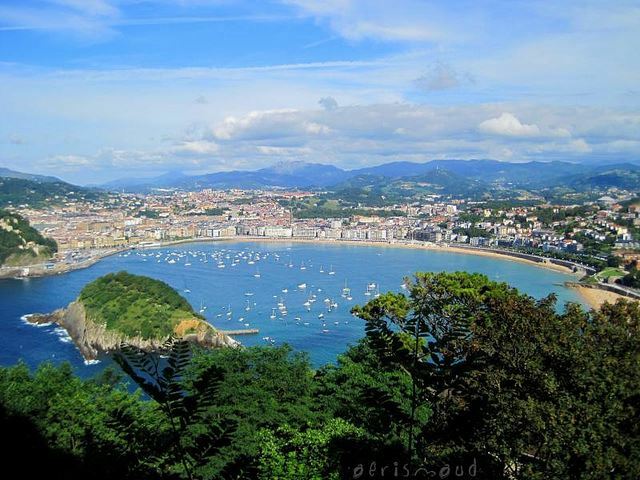 The coastline, jagged and green and then you hit the sandy beaches and the infamous pintxos in stunning San Sebastian, home to some of the best restaurants in the world – Etxebarri, Mugaritz, Arzak, Azurmendi and Akelarre. The steep hills and valleys breed more than Michelin-star chefs – they are also home to world class cyclists and mountain climbers. Drive inland for a day or two to medieval Laguardia which is surrounded by amazing wineries and visit prestigious bodegas such as Marques de Riscal in Elciego – we pick up a box of the signature wines you can’t buy elsewhere. If you hear a language that doesn’t sound like Spanish – it’s Basque Euskera – unrelated to any other language in Europe. The font or typography of Euskera is everywhere and you’ll quickly realise that the letters K and X predominate. As with Galicia, you’ll find that everybody speaks Spanish as well as Basque. Because the climate in Winter is cool and damp, we prefer to travel in June or September. It’s wonderful here in July and August but can be busy with vacationing Spaniards escaping the heat further south. Nestled in underneath the Basque Country, the climate here in La Rioja is warmer than in Green Spain – and the Summers are very hot – good news for the grapes and other crops that dominate the landscape. We highly recommend a two-day break to visit the acclaimed wineries with names such as Roda, Cvne and Rioja Alta. When eating out, you are in for a treat. Order anything ‘a la riojana’, the local style. Many wineries offer excellent food and wine pairing (book in advance) which we recommend. And Logroño’s tapas culture on Calle Laurel is worth checking out! Suso and Yuso monasteries will offer the injection of culture along with Vivanco’s wonderful art museum (which we’ve written about in our guide to wineries with art). 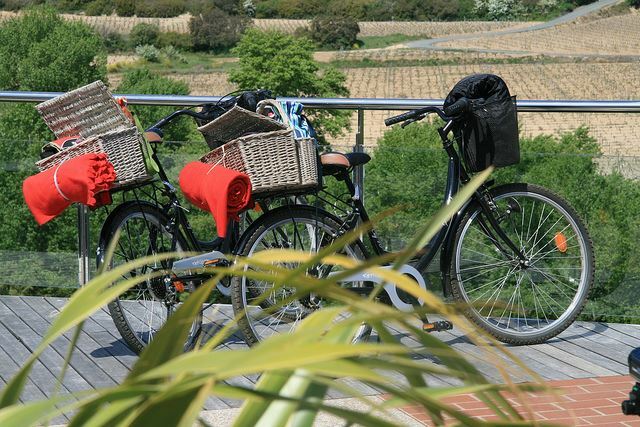 If you visit in late September, head along to the wine harvest festival! Alongside Rioja lies the region of Navarra. It’s famous for the San Fermin festival in Pamplona – but you can also leave plenty time to explore Estella-Lizarra for its Romanesque art, Olite for its castle, and Bardenas Reales for its unique desert-like landscapes used Game of Thrones. Roncesvalles is where many thousands of pilgrims begin their Spanish Camino de Santiago journey – as it’s the first official point after crossing the French Pyrenees. Why not pack some trekking shoes and do a stage to experience The Way? Afterwards, enjoy a meal of the many prized vegetables which come from Tudela – including artichokes, peppers, sprouts, peas, beans and white asparagus – served with local meats. Accompany the meal with a local red like Bodega Pago de Otazu – which featured in our wineries with art post – thanks to its impressive collection of sculptures by Anish Kapoor, Xavier Mascaró and Manolo Valdes. Aragon is another inland region, located between Catalonia and Navarre. It’s known for its elaborate mudejar architecture in the capital, Zaragoza – and for being the birthplace of Goya. If you are interested in painting, you’re spoilt for choice. Architects can also enjoy the Zaha Hadid bridge and the mudejar and modernist walking trails. The local diet consists of slow-cooked stews, great tapas and the wonderful wines of Somontano DO. Visit some of these wineries in Huesca. We also recommend visiting Albarricin – a small town that preserves much of the medieval and Islamic flavour bestowed on it as capital of the Moorish kingdom of Taifa. Aragon also offers top notch hiking and skiing in the Pyrenees. The climate in Navarre and Aragon consists of cold Winters and hot Summers. It’s almost impossible to imagine a trip to Spain without visiting La Familia Sagrada, Park Guell and Casa Battlo by Gaudi plus the other sights including the old gothic cathedral, Las Ramblas and Montjuic. Barcelona city is on the Mediterranean coast so expect humidity and warmth in the Summer but if you take a day trip to Monserrat which is 700 metres above sea, you’ll need an extra layer or two. 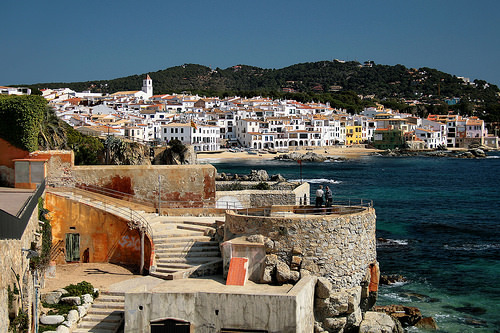 In August and September when the city gets a bit sticky, head for the Costa Brava to explore Dali’s museums, homes and castles, plus the wonderful cliffside villages and towns. Inland, there’s lots to see also including Peratallada, Besalu and Girona – home to El Celler de Can Roca – named best restaurant in the world. Girona and Besalu are also sites of significant Jewish heritage in Spain. In Barcelona, for a special meal experience, be sure to book ahead to get a table at highly solicited Tickets or Disfrutar. Don’t overlook more humble Catalan dishes like pan tumaca, delicious butifarra sausage, and the wonderful crema catalana. If you are there for calcots season, dig in – they are delicious! Discover the Priorat wine DO and take in a visit to a monumental cava winery. For the great outdoors, head to Aigüestortes i Estany de Sant Maurici National Park in the Pyrenees – which boasts mountain peaks over 3,000m high. Marvel at the castellers or human towers which you’ll see performed during fiestas in many Catalan towns and cities. Wherever you are, you’ll notice Catalan flags flying as you tour the region and you’ll see and hear Catalan spoken. It’s a Western Romance language derived from Latin – spoken by the Romans who colonised the Tarragona area of Catalonia. As with Galician and Basque, everybody who speaks Catalan can speak Spanish too. North of Madrid lies the largest region in Spain called Castilla y Leon. Because it’s so close to Spain’s capital, you can visit many of its key landmarks such as Avila and Segovia on a day trip. The university city of Leon is a bit far for a day trip but well worth an overnight to see its cathedral, the parador and taste the ‘morcilla’ which is a black pudding. All the tapas are free in Leon so the bars are bustling. Academics cite the university city of Valladolid as the place where Spanish is best spoken in Spain – so you might want to check it and its astonishing National Museum of Sculpture out. It’s especially atmospheric during Easter week when the solemn processions pass through the Plaza Mayor. It’s chilly at night in Spring so warm up at the many tapas bars or with a freshly baked torrija pastry from Cubero in the early hours of the morning. 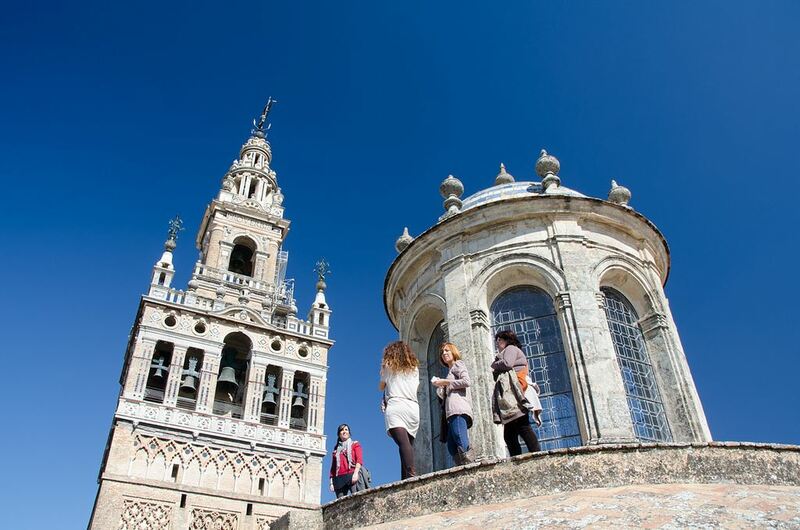 Salamanca is another wonderful university city – and is worth the trip just to climb the Clerics Tower. Recover afterwards with a generous helping of cured meats from the region. Burgos is another must-see for its UNESCO-listed cathedral and it’s also great winery territory – with the exclusive Ribera del Duero DO offering many enticing tours and tastings. Castile Leon is home to many of Spain’s best-loved castles – we recommend visiting Peñafiel, La Mota, Coca Castle and Cuellar – and Ciudad Rodrigo right on the border with Portugal. Being part of the Northern Meseta, you’ll find the days are very hot in Summer and freezing cold in Winter in Castile Leon. For this reason, we recommend travelling in Spring and Autumn. Madrid is the epi-centre of Spain and is the capital of the country. Hot in Summer and cold in Winter – you’ll find low humidity which makes it comfortable for visiting all year around. Must-see sights include the Prado, Reina Sofia and Thyssen-Bornemisza to see the work by Velazquez, El Greco, Goya and Picasso. 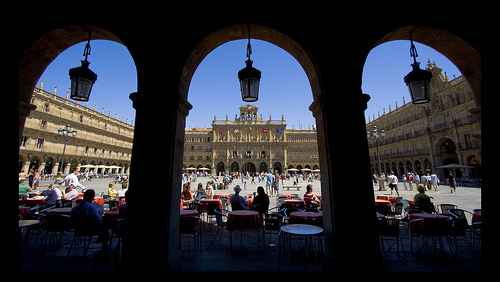 You’ll have to visit the city’s most famous squares such as Plaza Mayor and Puerta del Sol and the Retiro Park is a must. So are the city’s many foodmarkets including the Mercado de San Miguel. Soak up old Madrid in the Royal Palace and the Cava Baja area. The well-heeled side of Madrid is best observed in the barrio Salamanca. Historians will want to see the Plaza Dos de Mayo (commemorating the local uprising against the occupation by Napoleon’s troops) and literary fans should have a coffee at the Café del Espejo and the Circulo de Bellas Artes. The traditional cuisine here includes the hearty Madrid chickpea stew, the squid-filled-breadroll and a trip to San Gines for chocolate and churros. On the other end of the spectrum, you have DiverXo by local chef David Muñoz who has been awarded three Michelin stars. If you can’t get a table, try at the handful of two-stars including the newly crowned Coque by chef Mario Sandoval. Fancy a day trip? You can take excursions to Philip II’s castle and monastery in El Escorial and you have all the must-sees in Castile Leon and Castile La Mancha – plus the high-speed train in Spain means you can also take in a day trip to Cordoba or even Valencia. 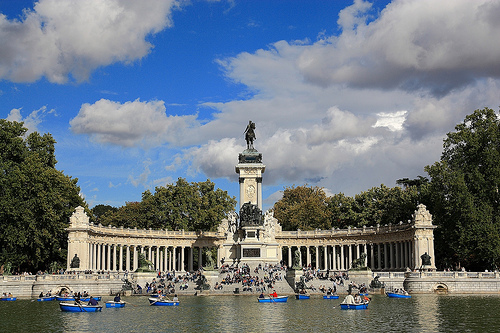 Have a read of our guide to Madrid and our separate guide on perfect day trips from Madrid. And Tips to Beat the Heat – Madrid in Summer! Castile La Mancha is third-largest region in Spain and is synonymous with Don Quixote, windmills and Manchego cheese. Toledo is one of the must-see attractions. It was the capital of unified Spain after the Reconquista – up until Phillip II moved his court to Madrid in 1561. Visit El Greco’s masterpieces and learn about the historical co-existence of Jewish, Muslim and Christian cultures inside the city’s walls. 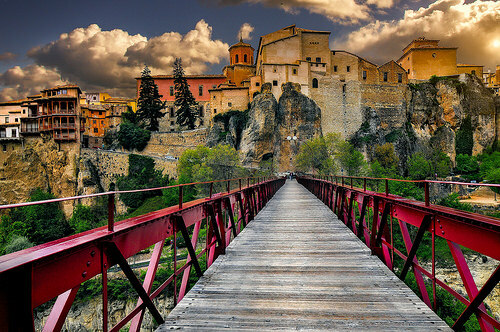 Cuenca is the other must-see. The historic UNESCO-listed walled town, perched on the top of a rocky hill is famous for its hanging houses called the ‘Casa Colgadas’ that are built into the rock face. Given its location in the Meseta Central, it can get pretty hot here in the Summer. Wheat, olives and grapes pre-dominate in the fields here – and with over 50% of all Spain’s grapes being harvested here, you’ll be able to visit lots of wineries such as Marqués de Griñon, Pago de Vallegarcía and El Vinculo (Grupo Pesquero). And football fans might want to check out Bodega Iniesta! You’ll also find a lot of castles to visit including Sigüenza, Jadraque and Belmonte. Menus here feature the cheese (which you have to try!) and roasts and slow-cooked meat dishes – and NB when you see gazpacho on offer in the winter months, don’t expect the typical chilled tomato-soup. ‘Gazpacho manchego’ and ‘gazpacho pastor’ are rabbit or chicken stews served atop unleavened bread. Wash it all down with a glass of El Vinculo and leave some room for some marzipan from Toledo with your coffee. 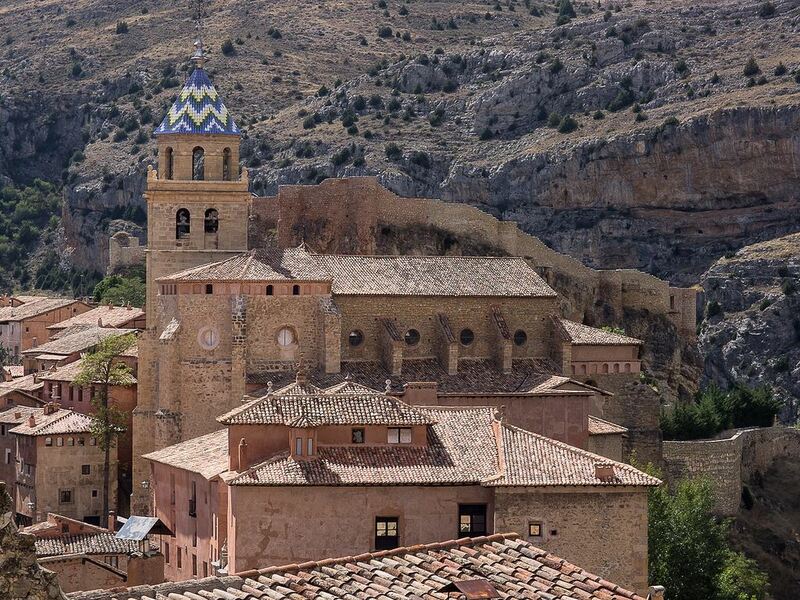 Read more about Toledo and Cuenca in our guide to the best day trips from Madrid. Jamon fans will already know that the best ham in Spain comes from Jabugo – in the region of Extremadura – which is one of our favourite off-the-beaten-track parts of Spain. North of Andalusia and bordering with Portugal, we cannot praise the cities of Merida, Caceres and Badajoz highly enough. Our favourite main square is in Trujillo – get a table with a view and order the migas – meaning breadcrumbs – the torta del Casar cheese and a glass of ‘Habla del Silencio’ made locally and you’re sorted for the day. The climate is Extremadura is extreme so you probably want to avoid visiting in July & August. Our favourite time of year is May when the evenings are warm and the cherry blossoms are in full bloom across the Jerte Valley (so romantic we included it in our guide to where to pop the question!). Early June and September is also very pleasant. 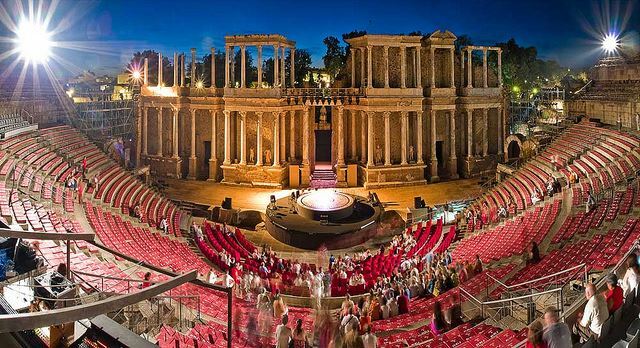 If you are there in July, head for Merida’s International Festival of Classic Theatre where you attend performances in the outdoor Roman theatre – truly unique! If you are looking for the part of Spain where you can hear the strum of the Spanish guitar, visit the white villages in the mountains and see flamenco – then it’s Andalusia you’ve been waiting for. Eight million people live here which makes it Spain’s most populated region. Much of the region’s history and architecture lays testament to the period under Muslim rule from the 8th to the 15th centuries. Millions of visitors come to Andalusia to uncover this Moorish past – visiting the Alhambra in Granada, the Alcazar in Seville and the Mezquita in Cordoba – and we highly recommend you do so also. (Make sure to read our guide to the Alhambra here.) And don’t overlook the Jewish heritage in Andalusia either. Religion continues to play its part today as you’ll see if you visit Seville during the Easter week processions. Gastronomy here in Andalusia is amazing and includes wonderful olive oils and the best jamon iberico from the Valle de los Pedroches – north west of Cordoba. Along the coast, you’ll enjoy the freshest of fried fish, prawns, a wonderful cured tuna called mojama, plus the obligatory gazpachos and ajo-blanco and salmorejo. Enjoy the wonderful sherries (and sherry wineries) from Jerez and Sanlucar de Barrameda and the Montilla-Moriles DO in the province of Cordoba. If you can’t get out into the region to taste the flavours, book a place on a food tour in the city. Make sure to visit the wonderful gardens here – the Generalife, the Alcazar and of course the patios in Cordoba. Early Spring is the best time to visit as the climate here is mild in Winter but very hot in Summer. The inland cities of Seville and Cordoba become quite uncomfortable in July and August and many locals head to the coast for the sea breezes. The Atlantic coast is the most refreshing but the Mediterranean coastline is also very bearable during July and August. Cities such as Malaga have wonderful museums including two dedicated to the life and works of Pablo Picasso – to dip into when the heat is at its highest mid-afternoon. The chilliest temperatures in Andalusia are to be found in the Sierra Nevada which is just 31km away from Granada city or 168km from Malaga – so you really can be sunbathing or golfing on the coast in the morning and skiing or snowboarding in the afternoon! Want something a bit more off-beat? Check out Almeria where many of the Spaghetti Westerns were filmed including The Good, The Bad and The Ugly – plus the many locations selected by the Game of Thrones in Andalusia – you can read about it in our guide to filming locations in Spain. And check out our Must-Sees in Andalusia plus Unusual Andalusia: Hidden Treasures! Murcia and Valencia on the Mediterranean Coast are the regions where citrus fruits, vegetables and flowers are cultivated for Spain and beyond. In Murcia city, we recommend visiting the Veronicas food market which dates from 1914 – and encourage you to taste as many of the vegetables and fruits including watermelons and kakis, nuts, oils, pulses, cereals and spices such as pimenton which is a smoked paprika. The Mar Menor lagoon is Europe’s biggest salt water lagoon and is one of Murcia’s main attractions – but we prefer to avoid the crowds and drive around this agricultural region. Stop off at a few local taverns to taste the best of the local orchards, vegetables patches and the Calasparra rice which is one of the most expensive grains in Spain. In Murcia city, you should also visit the Casino and head to the Fuensanta Santuary for great views of the city. 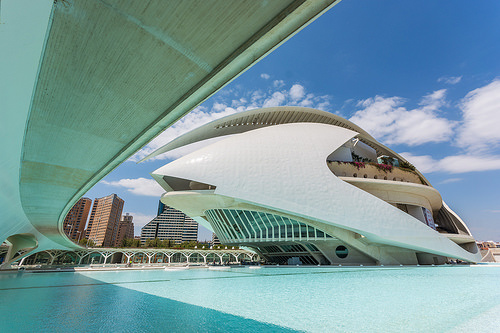 Valencia is also known for its rice – and is the birthplace of paella and the architect Santiago Calatrava. It’s also where Michelin-star chef Quique D’acosta runs his flagship restaurant in Denia – although you can also enjoy his influence in El Poblet, Mercat and Vuelve Carolina in downtown Valencia. Don’t forget to try the simpler dishes too when you are out and about – including the wonderful rices and our favourite fideua! If you are spending time in Valencia city, you’re spoilt for choice with dazzling markets, parks and museums – the City of Sciences and Arts is Instagram gold! If you’re travelling with university students, they’ll probably want to check out La Tomatina in Buñol where party-goers fling over-ripened tomatoes around the town for 60 minutes of madness to celebrate the harvest. Equally noisy (there’s a lot of pyrotecnics) are Las Fallas celebrations in mid-March when enormous model figures are set alight. We recommend checking out the bonfires for San Juan all along the coastline especially in Alicante – and the Moors & Christians festivals also celebrated all along this coastline but especially in Alcoy. If this sounds like too much noise, head for Albufera National Park to see the rice fields and explore the lagoon ecosystems. 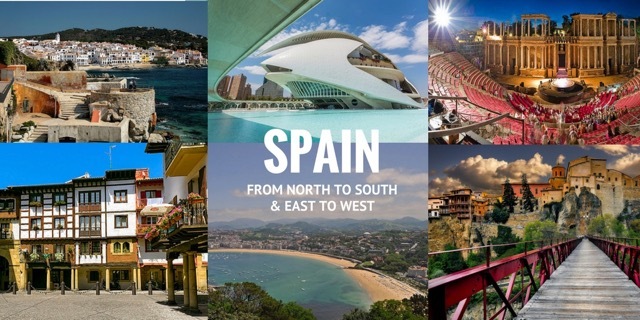 Posted in Getting Around, Insider Spain Guides, Useful Information and tagged Andalusia, Aragon, Asturias, Basque Country, Cantabria, Castile la Mancha, Castile-Leon, Catalonia, Eastern Spain, Extremadura, Galicia, La Rioja, Madrid, Mediterranean Spain, Murcia, Navarre, northern spain, Southern Spain, Valencia, Western Spain.